1. 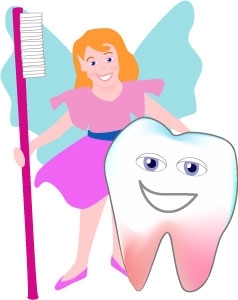 Visiting the dentist: It is recommended that you take your children to the dentist as early as possible, even if it is to accompany you, so they can become familiar with the environment. A book on “Going to the Dentist” will prepare them for the gloves, masks and the amazing chair! Once all 20 milk teeth have come through (around 2.5 years old) you should take your children to visit the dentist every 6 months (ideally, child friendly so the children can play on the chair, have stickers etc). They may prefer to sit on your lap and it may take a couple of visits for them to actually open their mouth. That is perfectly normal! 2. Brush their teeth twice a day with fluoride toothpaste: it is good to get children into habits from a young age. Even if they just chew the brush for one of the brushes they will still benefit and it will reinforce the routine. Use a toothpaste which contains fluoride as it helps keep teeth strong; it is now being sold for different age groups by Aquafresh which has different strengths of fluoride measured in parts per million (ppm). Just a smear of toothpaste is needed; not a pea size as they only end up swallowing it, which can then lead to other problems known as Fluorosis. It is advisable to follow the age guidelines, however when a child is capable of spitting out, it is clinically proven that using an adults strength toothpaste will reduce their cavities. A good way to get your children to want to brush is to actually watch you do it, so let them copy you and then do it too. When brushing use a small headed toothbrush and sit behind them and use a gentle circular movement. If that fails then there are child battery and Electric brushes available from approx 3 years of age. Did you know a child isn’t capable of brushing their teeth effectively until around the age of 8! 3. Fluoride: In Twickenham and Teddington we have a fairly low level of fluoride naturally occurring in our water. National levels range from 0.1 ppm to 0.4 ppm; we have 0.19 ppm so we do need to supplement with toothpaste. 4. Decay and Erosion: The main cause of decay in teeth is from sugar in the food that we consume. The best time to eat sugar is at a meal times but in reality biscuits are always available at playgroups and it’s not wise to completely deprive them of all sweet foods. It only makes for trouble when they get older and spend all their school lunch money at the corner shop!! If a child is going to have sweets, the friendliest is chocolate as it dissolves relatively quickly and does not stick to teeth. The worst sweets are sticky sweets such as Haribos, polos, boiled lollies etc that take a longer time to dissolve. Be aware that “No added sugar” on food labels does not mean there is no sugar at all present. For example any fruit that is pureed naturally releases sugar, which can decay teeth. 5. Disclosing tablets: once your child is able to spit out it is safe to use disclosing tablets at home to check how well they are brushing. They highlight plaque by staining it blue or pink, which can then be simply brushed off. They are available to buy in decent chemists for approx £3.